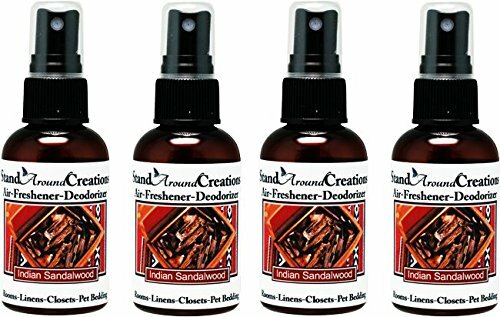 Set of 4 - Concentrated Spray For Room / Linen / Room Deodorizer / Air Freshener - 2 fl oz - Scent - Indian Sandalwood: A warm, sweet, rich woodsy fragrance. Scent: Indian Sandalwood: A warm, sweet, rich woodsy fragrance. Set of 2 - Concentrated Spray For Room / Linen / Room Deodorizer / Air Freshener - 4 fl oz - Scent - Vanilla Sandalwood: A beautiful combination of luscious rich vanilla, and Indian Sandalwood. Room Spray Natural Home Fragrance Ortigia Italian Amber & Musk 3.3 oz. Concentrated Spray For Room / Linen / Room Deodorizer / Air Freshener - 4 fl oz - Scent - Rose: A garden of red roses blooms from this artistically designed floral bouquet. Set of 2 - Concentrated Spray For Room / Linen / Room Deodorizer / Air Freshener - 4 fl oz - Scent - Cinnamon Vanilla - The scent of spicy cinnamon w/ sweet vanilla. Set of 2 - Highly Concentrated Air Freshener/Room Deodorizer sprays For Cars/Bath Rooms/Pet bedding/Linen closets/Etc. Scent: Frankincense And Myrrh 4 oz. each. Naturally Strong, Highly Scented.